Hyundai has revealed the 2011 Elantra at the Busan Motor Show in South Korea.Fully redesigned, the Elantra looks inspiring. In this Elantra wears a ‘Fluidic Sculpture’ design with four-door coupe styling, and HID (High Intensity Discharge) headlights and LED taillights. While no inside pictures were released, Hyundai says the cabin offers “advanced features not found on other compacts.” Goodies consist of heated rear seats, ambient lighting, and a color TFT LCD information display.The Elantra is powered by a 1.6-liter Gamma GDI (Gasoline Direct Injection) four-cylinder engine with 140 PS (138 hp / 103 kW) and 133 lb-ft (167 Nm) of torque. It is linked to a six-speed automatic transmission, which enables the car to be “10 percent more fuel efficient than its closest competitors. 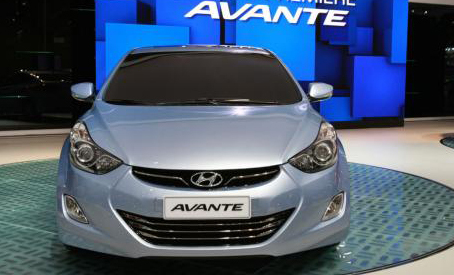 According to Steve S. Yang, President and CEO of Hyundai’s Global Business Division, The new Avante (Elantra) encloses Hyundai’s newest ambitions, featuring the best styling and presentation in its class. We are sure that it will once again redefine the compact section worldwide. The new Elantra is estimated to go on sale in Korea in the second half of this year.